Twitter, it seemed, had exploded. 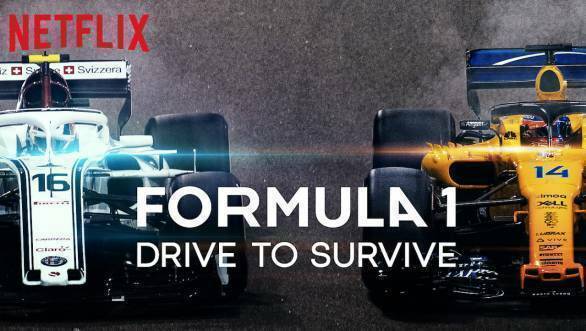 Every second tweet that I read that particular morning, appeared to be in praise of the new Netflix show Formula 1: Drive to Survive. And it was exactly this that made me wary. Surely, those glowing reviews that I'd seen floating around on the Interweb couldn't all be right, could they? Well, there was no way of verifying this, without actually watching the show. But seeing as I was already skeptical, I did what any reasonable skeptic would do - I put it off. I procrastinated. I told friends who texted me, urging me to watch the show, that I would get to it when work eased up. And, I carried right on, expecting that I would eventually find myself streaming it, but unwilling to commit five odd hours of my time to the task. And then, as an entire pack of Formula 1 journalists began their long journeys, from various parts of the world to Melbourne for the season-opening Australian Grand Prix, I found myself on a similarly long series of flights. Although, I must add, to not quite as glamorous a destination. I'd seen more tweets by then. It seemed as though the official in-flight entertainment ahead of the first F1 race of 2019 was this very Netflix show. I finally caved. I managed to download the first six episodes on my iPad before leaving to the airport. They would have to do. I'm usually the first person to fall asleep in an aircraft, often even before the plane has begun taxiing down the runway. But this time, I plugged in my headphones, and settled down to watch a series that would, no doubt, not live up to the hype around it. Within half an hour, I came to three conclusions. The first - I could not have been more wrong about the series. It really was deserving of all the praise that it had been receiving. The second - Guenther Steiner is the gift that keeps on giving. Just have a TV crew follow him around all day long, filming him call a spade a shovel, and you're likely to end up with a most gripping show. The third - I should have had more than one measly sheet of tissue with me. How anyone could get through that episode on Esteban Ocon, without developing massive amounts of moisture in their eyes is beyond me. And despite the fact that I usually try not to bother my fellow passengers while on board an aircraft, I'm afraid that on this particular journey I most definitely did. Drive to Survive had me burst into loud laughter. It made me clap a couple of times. It caused me to sniff somewhat audibly as I tried to choke back my tears. And it also made me gasp in surprise when cars crashed into each other, even though I'd already watched those races live, and really shouldn't have been surprised by the outcome. I, quite simply, was hooked. But Drive to Survive also drove home the point that many have long suspected is true. That to fall in love with a sport, and to cheer for an individual in that sport, we need to see them as human beings. Not as automatons clad in racing overalls and helmets, never saying one word that hasn't already been pre-approved by their PR people. And certainly not as show-puppets who attempt to make sushi before the Japanese Grand Prix, or who have to have some sort of piñata flogging contest ahead of the Mexican Grand Prix. Or whatever else it is that public relations teams think is a good idea. No, to truly follow a sport, we need to connect with the individuals who compete in it. We need to acknowledge that the need to relate to one another is an inherent part of human nature. And we need to understand that even though Formula 1 is an elite sport, and the drivers and engineers and mechanics who are part of it, are almost always the best of the best, they are, underneath it all, people. With their own strengths, weaknesses and insecurities. And allowing us a glimpse of this, is no bad thing. I certainly hope there's more where that came from. As I type this out, the first race of the 2019 Formula 1 season has already gone by. And it was a race that was tinged with sorrow for everyone in the paddock at Melbourne, and for motorsport fans around the world. Charlie Whiting, the director of the FIA and the official race starter for Formula 1 grands prix, passed away on the eve of the grand prix weekend. To say that he was an integral part of Formula 1 is a massive understatement. He ran Formula 1. In some ways, he was Formula 1. Drivers, team principals, journalists - nearly everyone in the paddock seemed to have a lovely memory of some small kindness that Whiting had done them at some point in time. And Formula 1 fans posted anecdotes on Twitter, about how Whiting, despite his many responsibilities, took time out of his day simply to reply to their motorsport queries via email. It goes to show what a huge void he has left in the sport, and just how much he will be missed. The F1 paddock will certainly be a poorer place without him. But Whiting's passing also brings to the forefront another point. That even though the entire Formula 1 circus is a well-oiled machine, it is the way it is because of human beings like Charlie Whiting. And we must never forget this. Thank you for everything, Mr. Whiting. We'll always think of you when those five red lights go out.